I am indeed happy to inaugurate this conference on "Capability Building for Cutting Edge Organizations in the New Business Order” hosted by the International Federation of Training and Development Organization (IFTDO). I am glad to know IFTDO is a worldwide network of Human Resource professionals and is committed to the identification, development and transfer of knowledge, skills and technology to enhance personal growth, human performance, productivity and sustainable development. I believe it represents more than 500,000 professionals in over 30 countries. 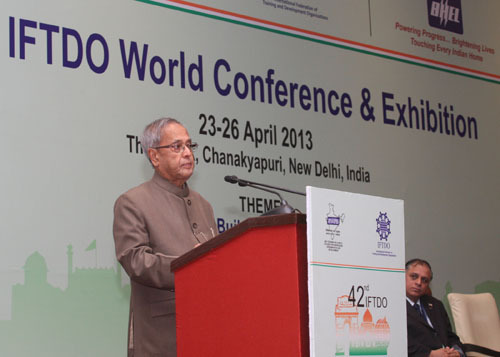 I am delighted the IFTDO has chosen New Delhi as the venue for this Conference and I welcome to India all the distinguished delegates who have travelled from far and wide. I wish them to have very successful deliberations and a comfortable stay in the country. This Conference has been organized at an appropriate time as the world is still to recover from the combined impact of the 2008 financial crisis and the recent Euro zone crisis. There are also critical skills shortages and talent deficit that act as obstacles to speedy recovery of the world economy. Experience sharing through such conferences is good way of accomplishing IFTDO’s vision of being a unique resource to the HRD profession working globally for the betterment of society and life. The present millennium has been marked by unprecedented pace of change world over. Change of this nature has been never before witnessed in the history of mankind. The new world order has made it possible for business to prosper in an open economy. This in turn has unleashed various elements of competition amongst organizations. To meet the challenges of change and competition, there is need to build cutting edge organizations that are lean, agile and responsive, capable of quickly moving to take advantage of new opportunities and remaining ahead of change. Knowledge and skill obsolescence is a daily reality, with the ever increasing pace of change in technology. Training, re-training and redeployment of human resources on a continuing basis must be a priority for any organization. The power of information and communication technology also needs to be harnessed to create an empowering work culture within organizations. Apart from building capabilities, there is also need for constant innovation in ideas. And, ideas alone are not enough, they also need to be implemented. For innovation to be successful, the whole value chain, namely, idea generation, conversion, and diffusion need to happen with efficiency and effectiveness. It is in this context that capacity building becomes a critical element in the development of any organization. Human resource development is one of the most effective ways to bring about organizational transformation for sustained growth. People are the key drivers of competitive advantage of organizations as well as society. Economies that adequately invest in human resource, and research and innovation, are likely to have higher productivity gains. At a time when the global economy is trying to emerge from the financial crisis, a paradigm shift in the way global businesses are run can be important contributors to growth. The theme of this Conference, "Capability Building for Cutting Edge Organizations in the New Business Order” is therefore extremely relevant from the point of view of finding answers to our growth problems. The world economic growth had declined from 3.9 per cent in 2011 calendar year to 3.2 per cent in 2012. Though it is expected to revive in 2013, the growth rate is not projected to be significantly higher. Only in 2014, it is projected to grow at 4.1 per cent. These are important indicators for the businesses and industries located in different geographies to take cue from and initiate suitable strategies to stay ahead of competition. In an outlook where global demand is not likely to firm up in the near future, it is the competiveness of firms that will determine their bottom lines. Technology and manpower are the key drivers to build superior business organizations. Let me make a few remarks regarding India’s economic prospects. Like most other countries in the world, our economic growth has also declined during the last two years. In the decade 2003-04 to 2012-13, the average annual economic growth of our economy was a healthy 7.93 per cent. Of this 10 year period, we have a block of 5 years, from 2008-09 to 2012-13, when the world economic growth was extremely sluggish, fragile and uncertain. Though our GDP growth in 2012-13 at 5.0 per cent is the lowest in 10 years, it is much higher than that of G-7 countries. International projections point out that our growth will continue to be better than that of these economies for the next two years. India has been progressively liberalizing its trade and investment sectors. The international trade to GDP ratio of India at 44 per cent signifies the depth of our economy’s integration with the world economy. While our economy cannot remain immune to a prolonged global financial crisis, we are working hard to reverse the deceleration in growth. We are confident that we will return to 7 to 8 per cent growth bracket in the next two to three years. We need to revitalize investments in the country for this purpose. We are making our systems more responsive to the industry’s need for facilitation and timely clearances. A Cabinet Committee on Investment has been constituted to approve, monitor and review major projects for their time-bound implementation. We welcome foreign investment which has a critical role in bringing in modern technology and globalising our economy. Even as Indian industry steps out to invest abroad, we welcome foreign investors coming to India, and using India as a part of their global supply chain. In general, foreign investors have been positive about our economy. The net inflow from Foreign Institutional Investors at US $ 31 billion in 2012 is a substantial rise from the US $ 8.3 billion in 2011. Between April 2012 and February 2013, US $ 20.9 billion have come to our economy as FDI. According to an important survey, India is the third most preferred destination for Foreign Direct Investment (FDI), after China and the US. Our infrastructure sector has great potential to make productive use of these investments. The sectors with high linkage to infrastructure such as automobile, steel and cement, enjoy high growth in India as compared to many of her competitors. Manpower and technology are the prime drivers of industrial progress. Abundant manpower underlines India’s comparative advantage. India is in a phase of unprecedented demographic change. In 2020, the average Indian will be only 29 years old as compared to an average age of 37 for China and the US, 45 for West Europe and 48 for Japan. We are conscious of the need to leverage this demographic advantage to enable India become a more vibrant, dynamic and prosperous nation. To develop our manpower, a National Skill Development Mission has been launched with the goal of skilling 500 million people by 2022 in a public-private initiative. A Vocational Training Improvement Project has also been started to up-grade 400 industrial training institutes. I understand that during this four daylong Conference important topics such as capability building and managing performance excellence in organizations, building winning organizations, managing issues and challenges of youth, shaping leaders of tomorrow and corporate social responsibility etc. will be discussed. I am confident these deliberations will contribute to spurring industry leaders develop capabilities that can accelerate growth across the world. We in India would like to see our Industry compete successfully with the best in the world. Skilled manpower and availability of a competent cadre of management professionals will play a key role in this strategy. In order to achieve its national goal of inclusive growth, India also needs to develop capabilities of our social sector to ensure efficient delivery of services with equity and social justice. We want to ensure that the fruits of development reach each and every citizen of the country, especially those at the margins of society and the base of the pyramid. I hope this Conference would provide a significant impetus to field of human resource development within India. I call upon the IFTDO and Indian Society for Training & Development (ISTD) to continue to play the role of a catalyst in policy formulation and execution of human resource interventions to improve personal and organizational effectiveness. I wish the two organisations and all distinguished delegates gathered here productive discussions and express the hope that they will continue to work to enhance the quality of life of people.